Pro Rail Services’ Haulage Division provides the combination of specialist rail and haulage knowledge to offer a high quality and efficient service. Using highly trained operators and the latest technology we provide an industry leading solution. 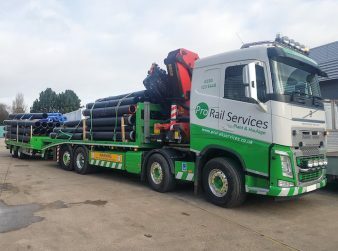 We have an extensive network of customers ranging from Specialist Rail Contractors, including RRV plant suppliers, through to Civil Engineering contractors, Highways, Site welfare specialists, and Tool and Generator Hire. 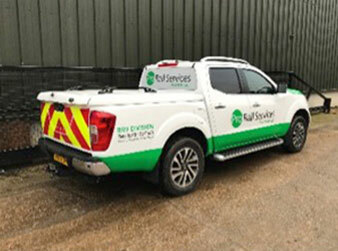 24 Hour Service – We provide a 24hr service to ensure we always end of the phone to service your requirements be it day or night. 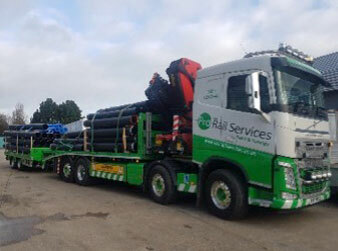 Specialist Rail HGV Drivers – Our drivers are highly experienced HGV drivers who also hold RRV certification, ALLMI, PTS and CPCS Plant categories. 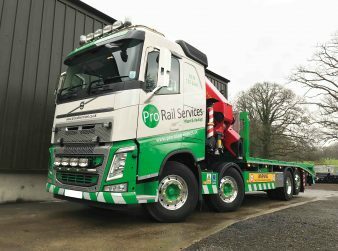 This is to ensure our clients are supplied with competent drivers who understand the importance of the railway materials and have a versatility of machines a nd skilled operative tasks. Fully RISQS Audited – We are licenced to work trackside. CPA / RPA Members – We are members of the Construction Plant Association and the Rail Plant Association.